There really isn’t a great deal to see except to notice that the fore deck of the boat is a bit cleaner than the rest of it. It is going to be a long job but today I started to remove grime which has accumulated over many years. 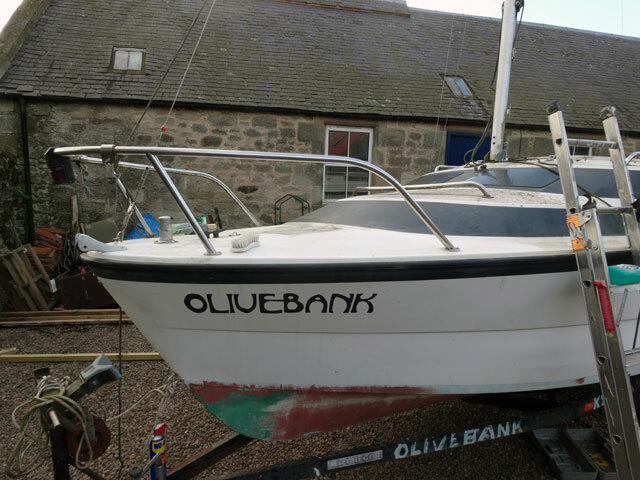 By the time that Olivebank goes back into the water next year she will be a beauty! Rose, showered and took Mix for a walk – today is very dreich. Breakfasted and then chatted with Tom and David. David set off to discuss with his friends how best to sort out the trailer for Olivebank (and to meet another friend for lunch). Tom and I had a look around the Hen House to make plans for our winter programme and then I drove Tom home. We had chatted away the morning and it was already lunchtime. I visited the doctor who pronounced me fit and well and gave me my flu jab. David returned with all his bits and pieces and great plans for how to deal with Olivebank’s trailer. Meanwhile I had started cleaning her fore deck and making progress using a small nailbrush and some Co-op cleaner. I was quite taken aback: I had a bottle of Co-op cleaner at two bottles for £2 and a bottle of dedicated yacht cleaner at £14.50p. The Co-op cleaner was significantly better at cleaning Olivebank. During the day Rachel took Mum to her hairdresser for her regular appointment. Rachel also went into Duns for her flu jab. Olive and Digger cleared away all of the debris which came off their roof during yesterday’s roof repair and David took a wheel from Rachel’s Bongo to be repaired. And BT fixed Olive and Digger’s phone line. So everyone was busy today. Rachel also had a visit from a lady who is interested in joining the course on kilt-making at the start of next month. The newspaper article in the local paper has certainly stirred up quite a bit of interest. We all dined together in the farmhouse and in the evening Rachel and I relaxed in the Granary. I enjoyed watching Scott and Bailey before the News and in the earlier part of the evening I gave Olivebank’s tiller its first taste of sandpaper for many a long year. Mix and Rowan continue to be in good form and they too enjoyed relaxing in front of the stove before their final walk of the day and bed.